Voted Best Master Planned Community, the Cordera neighborhood features a unique landscaping program, classic architecture plans and high performance energy rated homes. These spectacular single family homes range from the 300's to the 800's with an affordable median price of 450,200. The Cordera community offers miles of interlinking trails and storybook themed parks, all centered around a state of the art 8000' with a fitness room and heated outdoor pool. 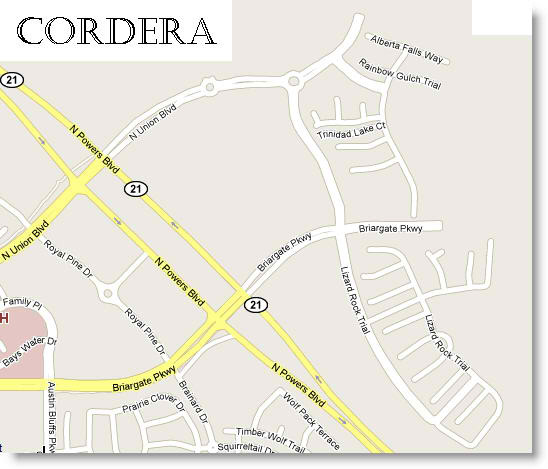 Cordera is located in an ideal spot as well. Situated just off Powers near Woodmen, there is easy access to shopping, dining and theaters south along the Powers corridor or at nearby Chapel Hills Mall or the Promenade Shops at Briargate. Many of the area's soldiers also call Cordera home. With Peterson and Schriever AFB's to the south straight down Powers and the Air Force Academy just a few minutes’ drive to the west on the Briargate Parkway, Cordera provides easy access to the areas military facilities. Most students here attend school in the highly accredited Academy District 20, and most high school students attend Liberty High School. Among many other excellent schools in the area, the private Rocky Mountain Montessori Academy is also nearby which accommodates parents who are seeking the finest education for their children. With its close sense of community, nearby shopping and dining, as well as ease of access to military bases and highly coveted schools, Cordera is a great place to consider buying a home.